Today is Chap Goh Mei, the 15th and final day of the Chinese New Year celebrations. This occasion is celebrated with greater prominence by certain quarters of the Chinese population. 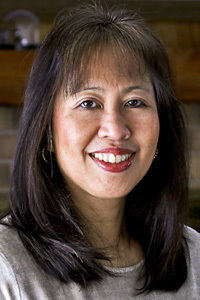 In the old days, Chap Goh Mei was equivalent to Valentine’s Day in the cities of the Straits Settlements comprising of Penang, Malacca, and Singapore. The cloistered damsels of rich Peranakan families rode to town in a covered trishaw, safely accompanied by a chaperon to enjoy the festivities. Apart from exchanging glances with the local boys, there was also the custom for these girls to toss oranges into the ocean as they make their wish for a good match in the future. An urban legend has it that some of the more adventurous guys actually wade out into the ocean to collect the oranges either for eating or audaciously claim the hand of the maiden to toss it. I suppose if there is a will, there is way. This custom continues to this day in the city of Penang. Dumplings are usually made with pot sticker or wonton wrappers, easily purchased at the Asian grocery stores. These wrappers are made of wheat flour. For a gluten-free option, I use Vietnamese rice wrappers instead. They are more delicate and not as sturdy but they do give a nice translucent appearance to the dumplings. They hold up pretty well in smaller dumplings but larger ones like these should be handled gently. 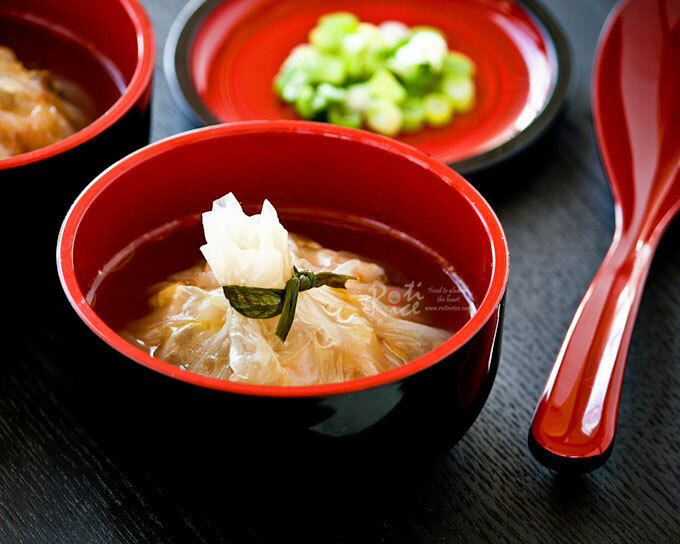 Small tears in the wrapping will not be visible once the dumpling is immersed in the soup. Dumplings wrapped in rice wrappers should first be steamed so that the wrapper stays with the filling. Cooking them directly in the soup causes the wrapper to unravel. Another gluten-free option is to use Napa cabbage as a wrapper. 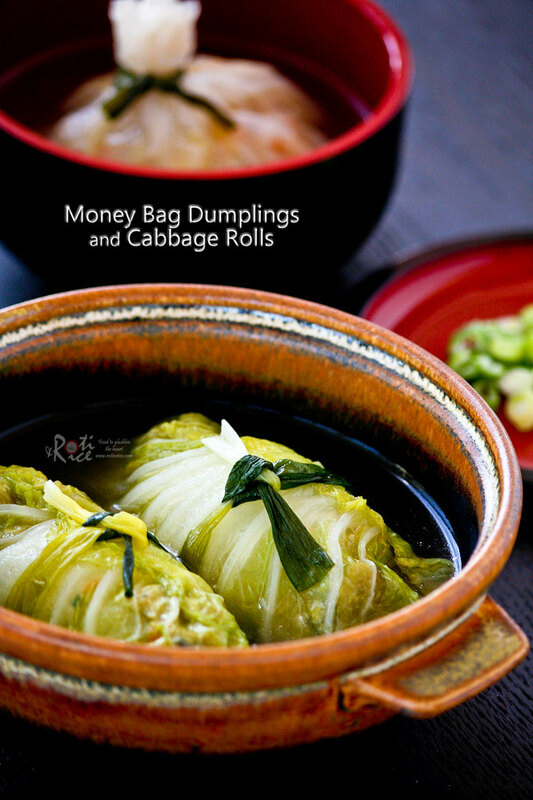 The amount of filling in the recipe below is sufficient for either 4 large Money Bag Dumplings or 8 small Cabbage Rolls. Please double the filling if you intend to do both. Mix all filling ingredients, except shrimp in a bowl. Allow it to marinate for 30 minutes. Fill a large shallow bowl with warm water. Dip one rice wrapper into warm water and remove quickly. Lay wrapper on a lightly oiled dinner plate or cutting board. Rice wrapper will soften. Place a portion of filling onto dampened rice wrapper. Top with 8 tiny pieces of shrimps (equivalent to 2 shrimps). Gather edge of wrapper up around the filling. Tie with blanched green onion. Place onto a lightly oiled shallow bowl or casserole dish. Repeat with the other 3 portions of filling. Divide filling into 8 equal portions. 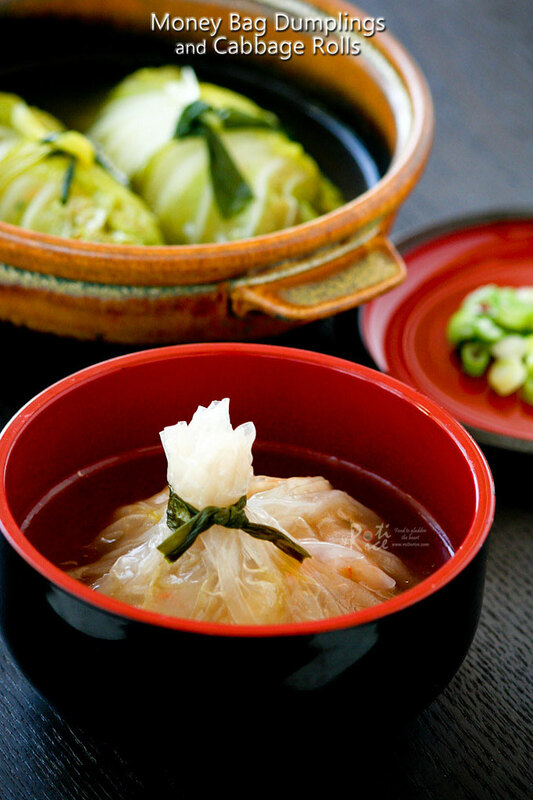 Place a portion of filling onto the white edge of a blanched Napa cabbage. Top with 4 tiny pieces of shrimps (equivalent to 1 shrimp). Roll cabbage around the filling like a jelly roll. Tie with blanched green onion. Place onto a shallow bowl or casserole dish. Repeat with the other 7 portions of filling. Fill a large pot with about an inch of water. Place a rack at the base of the pot. Bring water to a boil. Place dish with dumplings or cabbage rolls on rack. Cover and steam for 10 minutes. 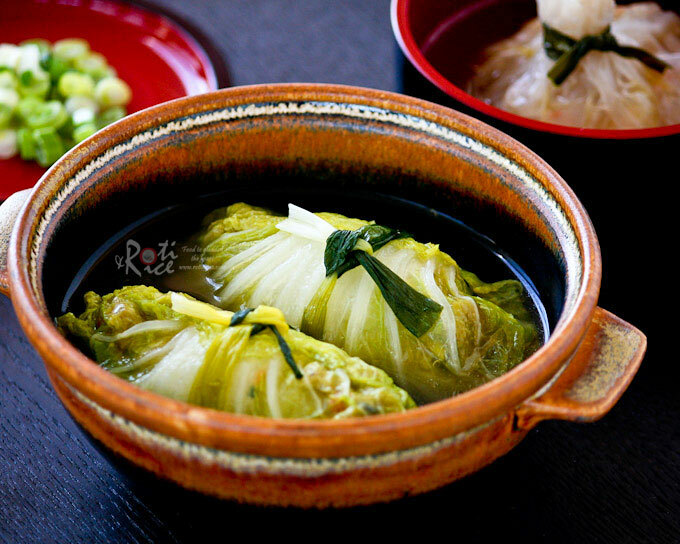 Gently transfer one dumpling or two cabbage rolls with a large serving spoon into individual bowls. Ladle some soup into bowls about half way up the sides of dumplings or cabbage rolls. Add a few drops of sesame oil. Serve hot with dumpling sauce or soy sauce. ** Instead of 4 large Money Bag Dumplings, you can make 8 small ones. 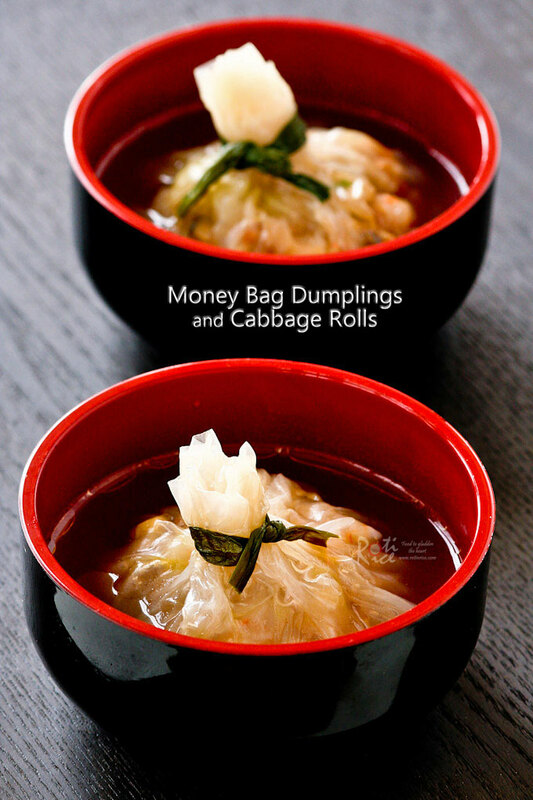 These delicious Money Bag Dumplings make a lovely and impressive appetizer. The huge dumpling need not be transferred to a plate to be cut up for eating. Bite size pieces are cut and scooped up with the spoon together with a little soup. The Cabbage Rolls may be cut into halves or thirds for ease of handling. Do check out the linky below to see what the others have prepared in their kitchens. Wishing you all a very Happy Chap Goh Mei! Hi, Biren. Happy Chap Ngoh Mei! We had wontons , roast pork and bak Cham Kai to celebrate the last day of Chinese New Year tonight. I love your take on the Vietnamese wrapped dumplings, and the cabbage rolls, very unique and definitely something I am considering of trying for my next dinner party. Have a nice day. Aha! You have now given me another idea, to make chee cheong fun. I will be making the money bag dumplings this coming Sunday for a party. And I will certainly try to make the cheong fun as well. Knowing my daughter, she will ask for prawn cheong fun… Thanks again for the tip. Those dumplings look delicious! I love the see through rice wrappers! These are so beautiful! I love the different options you’ve presented, and the photos are so enticing. Happy Chinese New Year!! Love the idea of using rice paper for these dumplings. That’s a very cool gluten-free alternative that I had never thought of! Happy Chinese New Year! Thanks Victoria! Those rice wrappers are a God sent for me as one of my sons is on a gluten free diet. I have been using them as wraps for all kinds of dumplings for a while now. They are a little more delicate but works pretty well under most circumstances. Just wondering if ShaoXing wine is gluten-free as well? Shao Hsing rice wine is made of glutinous rice but I am not certain about the yeast used.